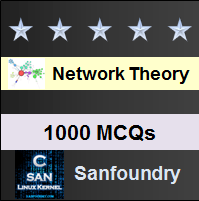 This set of Network Theory Multiple Choice Questions & Answers (MCQs) focuses on “Constant-K Low Pass Filter”. 1. A network either T or π, is said to be of the constant-k type if Z1 and Z2 of the network satisfy the relation? Explanation: Z1,Z2 are inverse if their product is a constant, independent of frequency, k is real constant, that is the resistance. k is often termed as design impedance or nominal impedance of the constant k-filter. 2. In the circuit shown below, find the value of Z1. Explanation: The constant k, T or π type filter is also known as the prototype because other more complex networks can be derived from it. From the given figure, the value of Z1 is jωL. 3. In the circuit shown in the question 2, find the value of Z2. Explanation: From the prototype T section and prototype π section shown in figures, we get the value of Z2 is 1/jωC. 4. The value of Z1Z2 in the circuit shown in the question 2 is? Explanation: Z1 = jωL and Z2 = 1/jωC. So the product Z1Z2 is jωL x 1/jωC = L/C. 5. Determine the value of k in the circuit shown in the question 2. Explanation: We got Z1Z2 = L/C. And we know Z1Z2= k2. So k2 = L/C. So the value of k is √(L/C). 6. The cut-off frequency of the constant k-low pass filter is? Explanation: Z1/4Z2 = 0. Z1 = jωL and Z2 = 1/jωC. On solving the cut-off frequency of the constant k-low pass filter is fc= 1/(π√LC). 7. The value of α in the pass band of constant k-low pass filter is? Explanation: The value of α in the pass band of constant k-low pass filter is α= 2 cosh-1⁡(f/fc). 8. The value of β in the attenuation band of constant k-low pass filter is? Explanation: We know that in the attenuation band, Z1/4Z2 < -1 i.e., f/fc < 1. So the value of β in the pass band of constant k-low pass filter is β= π. 9. The value of α in the attenuation band of constant k-low pass filter is? Explanation: α = 2 cosh-1[Z1/4Z2] and Z1/4Z2 = f/fc. On substituting we get α = 2 cosh-1⁡(f/fc). 10. The value of α in the pass band of constant k-low pass filter is? Explanation: We know that in the pass band, the condition is -1 < Z1/4Z2 < 0. So α= π.